Kicking off a new series for 2019, we are proud to introduce you to Focus on Philanthropy, where we will periodically highlight the great work being done in our communities by stellar nonprofits. In this edition, we are putting the spotlight on the Quiet Storm Foundation in Las Vegas, Nevada. According to the United Way of Southern Nevada Community Report, in Nevada 54% of jobs require a post-secondary degree and only 30% of residents qualify. Achievement gaps are one of the most visible types of educational disparity. Nevada has the lowest graduation rate in the country for black students, as well as the second-lowest for English Language Learners (ELL). For ELL, black, and Hispanic students, gaps in high school achievement perpetuate cycles of poverty and widen already-existing socioeconomic differences. Source: United Way report on High School Graduation Rates in Clark County. Lifetime wages for adults with a high school diploma are approximately $300,000 more than students who did not graduate from high school. College graduates make $1.2 million more. First Foundation was introduced to the Quiet Storm Foundation in Las Vegas, Nevada. We were inspired by their mission to have a positive impact on underserved youth by providing educational and recreational opportunities. The organization was selected to receive our Supporting Our Communities grant. As part of our process to provide strategic support, we always start with an exploratory meeting. During our exploratory meeting, we ask two questions: 1. What keeps you up at night, and 2. If you had a magic wand and could do anything, what would you do? Somewhere between the answers to these two questions we create a strategic outline to begin our work. 1. Marketing –How do we get the word out? 2. Donor stewardship – How do we properly thank those who have supported us? 3. Fundraising - Where do we find new partners to help these kids? Identifying goals is one step. In small organizations like this, operating 100% with volunteers, everyone works hard. The board started with dividing the donor list from their Hoops for Hope Basketball Camp event and personally called each donor to thank them for their contribution. They were asked to share a story of impact and share how their contribution resulted in changing lives. The next step was to focus on potential new partners. One example was a huge success. The board focused on the UNLV Lady Rebels basketball team. Their efforts led to a wonderful new relationship and all of the kids were invited to attend a home game and meet the team. One of our employees, Kynesha Jackson, was so moved by the organization she joined the board. The energy on this board is impressive and they were eager to learn about how their individual story-telling skills will be the key to finding funders, meeting more donors, and finding individuals who will share their passion. They continue to practice sharing stories of impact. 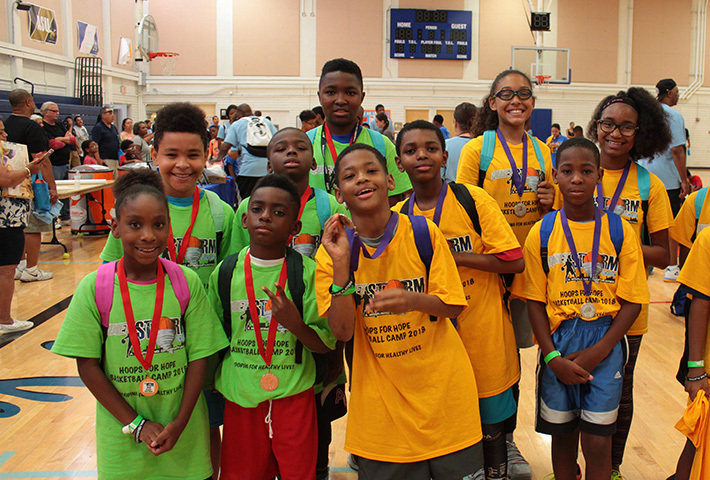 As a result of the hard work by their board, over 200 children will participate in a free basketball camp that includes leadership training, healthy eating education, and skill development. They will have the opportunity to meet professional players who will share leadership stories. A program called S.T.O.R.M. provides a safe and positive outlet to develop leadership and life skills twice a month on Saturdays, and the Black History essay contest provides an opportunity for kids to learn, write, and present stories in front of community leaders. Get the board active in the community. So often, individual board members underestimate how valuable they are to the organization. It is their voice in the community that helps the organization connect to individuals who can share their time, talent, and treasure. Their stories provide credibility, trust, and validate the impact – and when they connect an individual to the organization, it changes the volunteer/donor’s life as well. A true win-win! If you would like to learn more about Quiet Storm and how you can support their mission, please contact me at mdutch@ff-inc.com. I will gladly make the introduction to Cathy Watson, a remarkable resource at The Quiet Storm.